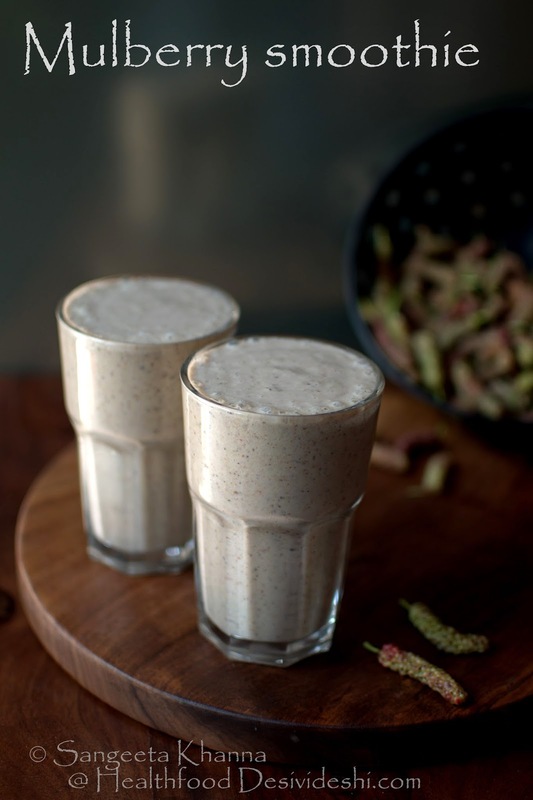 We have been surviving on cooling foods as Indian summers don't leave you with an option. You eat one heavy meal in a week and rely on light and cooling kinda food the rest of the days. This is the time I don't care about a dense protein portion in each meal, the body doesn't need it much if I am not working out. And it has been a bit hectic and workout routine a bit irregular and less intense if that is the correct way to put it. 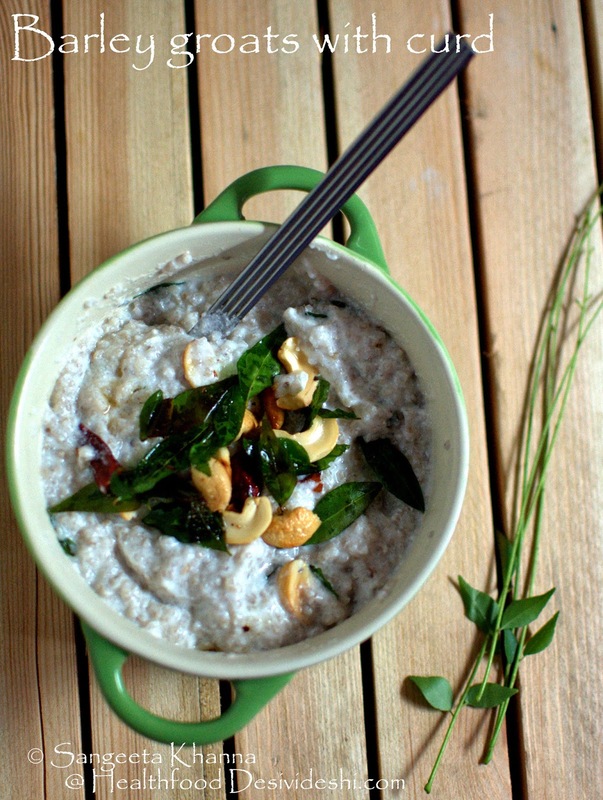 I have been gorging on curd rice and it's numerous variations for at least one meal everyday. A large kettle of green tea is brewed along with any fresh herb from the garden, lemon balm or mint or the desi (wild) rose petals, sometimes lemongrass or even peppermint. I pour myself a glass of this tea, add ice cubes and keep sipping. Sometimes a small tidbit to go with it. 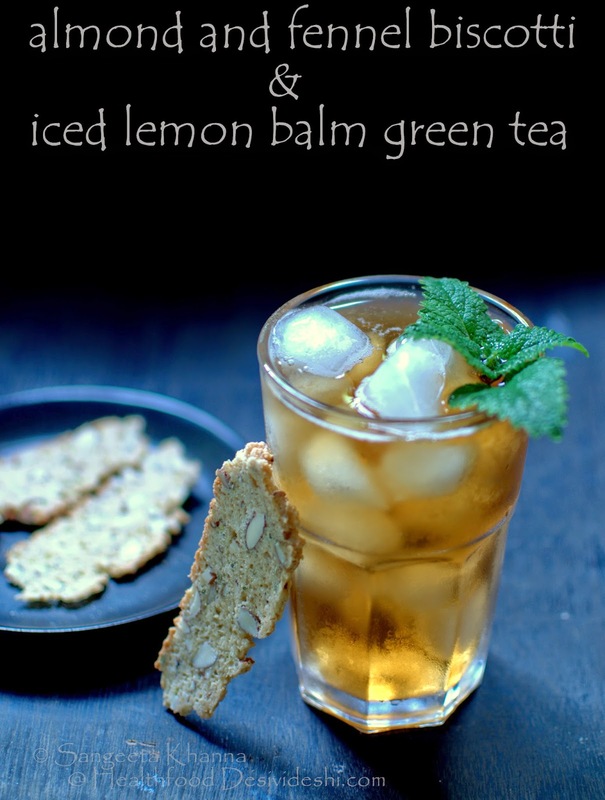 This lemon balm green tea has a calming effect when I am overworked.. I talked about this fennel and almond whole wheat biscotti earlier, this is great stuff. This cooling dessert sometimes becomes our dinner. We have been eating mangoes for dinner since childhood, just the mangoes and nothing else as there used to be loads of mangoes to be devoured and we all just loved them. 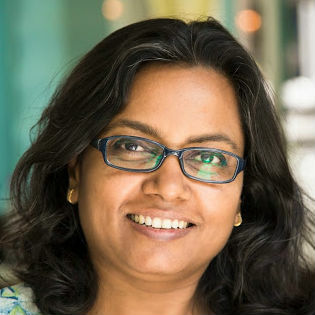 We used to have aam malai, aam ras (pulped mangoes, especially the desi variety) or just sliced mangoes. I have been making mango sticky rice every season too but this dessert meal is even more easy. Mango kulfi falooda when I feel fancy. 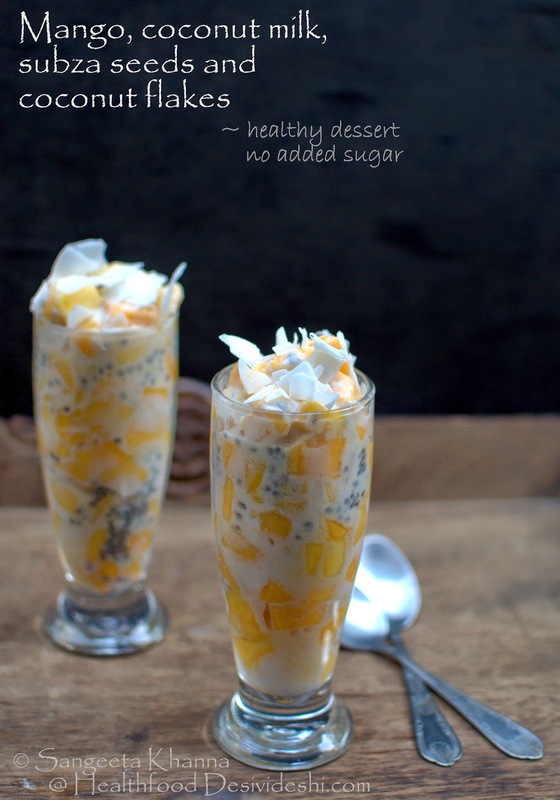 The mango, coconut milk, subza seeds and coconut flakes make a nice filling dessert meal, add as much of each ingredient as you like and have it chilled. Check out the various mango salads with mint, phalsa berries and seeds and nuts posted on this blog in the past. Those are my summer staples. Subza is basil seeds and is very cooling for the system. I have been making melon smoothies a lot last year. 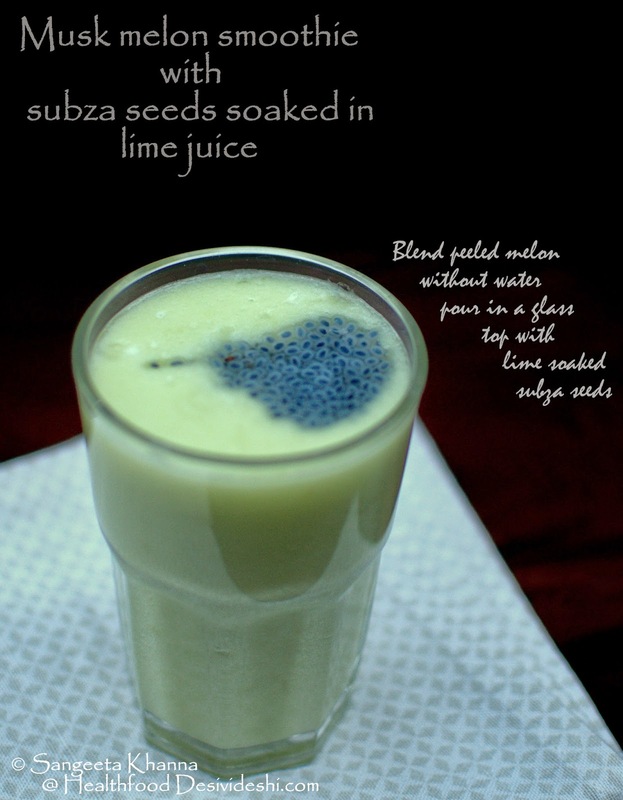 This musk melon smoothie with lime juice soaked subza seeds is such a refreshing cooling drink for summers. Just blend Muskmelon cubes without any added liquids and pour into glasses, top with a generous tbsp of soaked subza seeds and enjoy. Watermelon is a boon for summers. This watermelon spritzer is a sip of heaven. 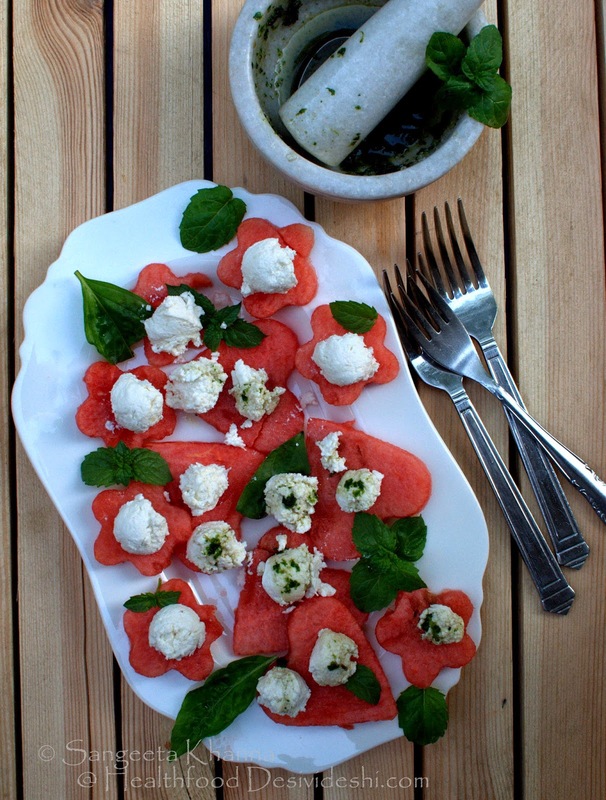 I make the watermelon and feta salad quite frequently with home made feta. This time I scooped out the feta using a melon baller and infused it with a sugar macerated (add sugar and herb and mix in mortar and pestle) paste of basil and peppermint. I made it about a dozen times already this summer. That good. My pineapple kanji has been a favourite with friends and family for some years now. 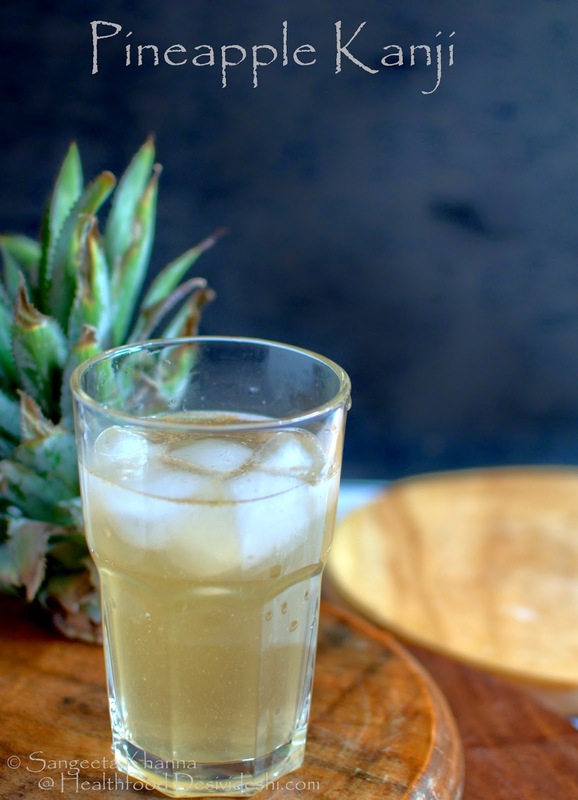 An iced glass of this kanji is healthy and cooling, supportive to gut flora as well. 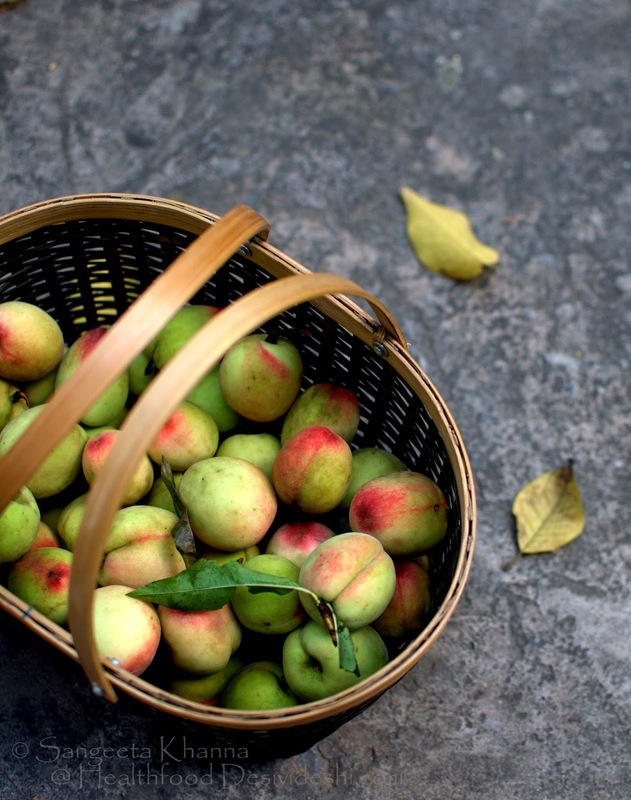 Seasonal fruit in summer are nature's way of letting us know that we are blessed. The best coolers are the seasonal fruits. Peaches are one of summer favourites. 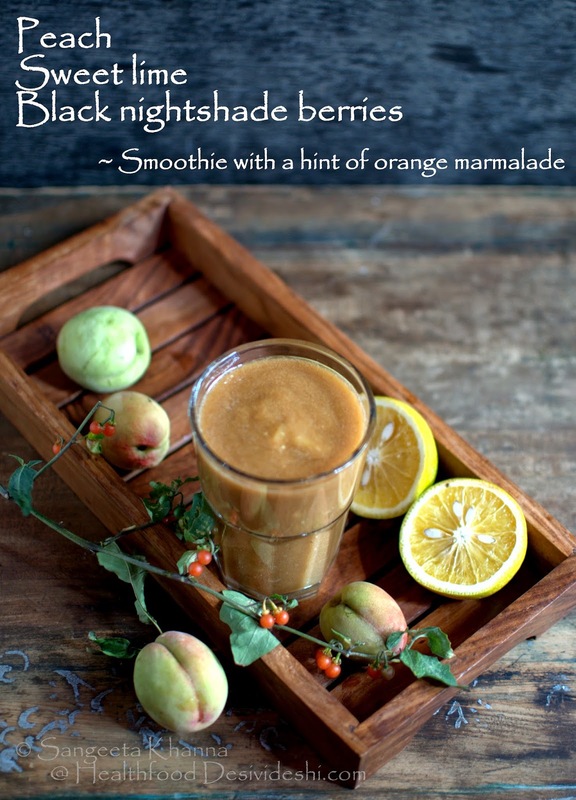 I make this yummy smoothie with sweet lime slices, peach slices and a tbsp of orange marmalade added to the blender. A little sweet lime or orange juice is added if required and the smoothie is a store house of antioxidants. Lunch in a hot summer day should be either curd rice, panta bhat or a nice salad for me. 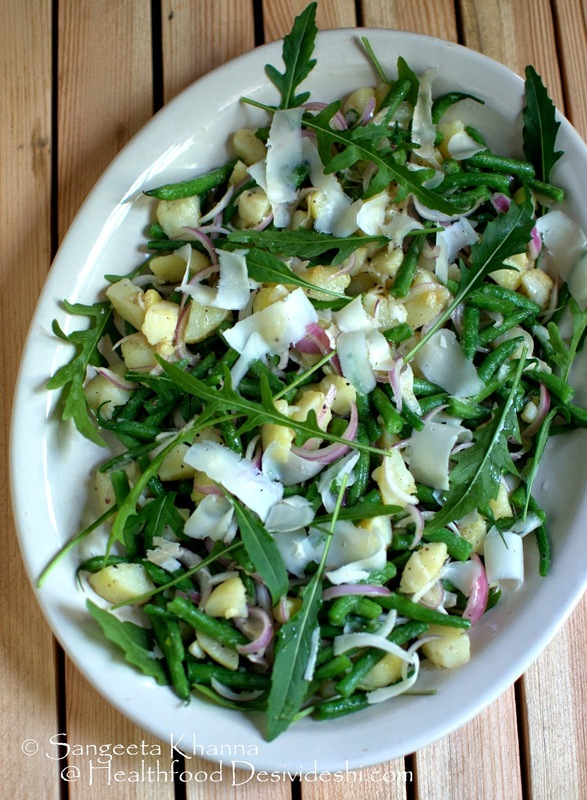 Here is the current favourite salad with beans, potatoes, rucola from the garden and shavings of Parmesan. All seasonal fruits make it easy to rustle up a fruity meal with minimal effort. 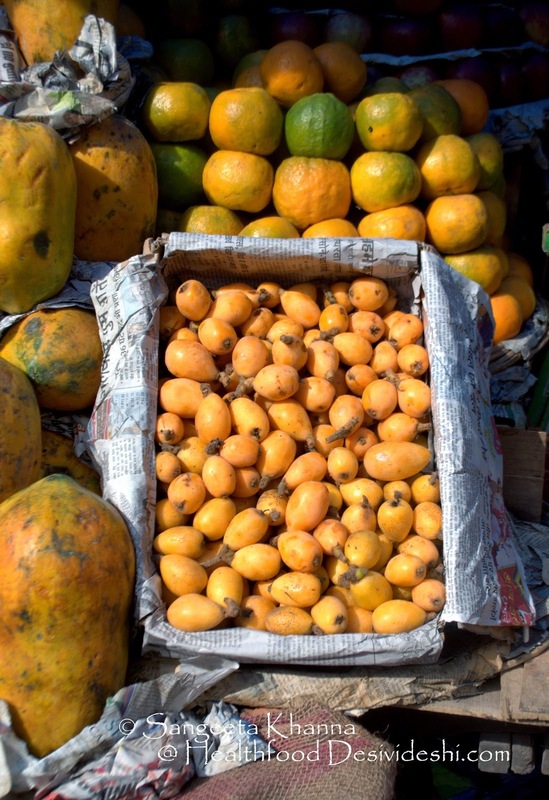 I love papaya, oranges and the loquat that are so bountiful in summers. 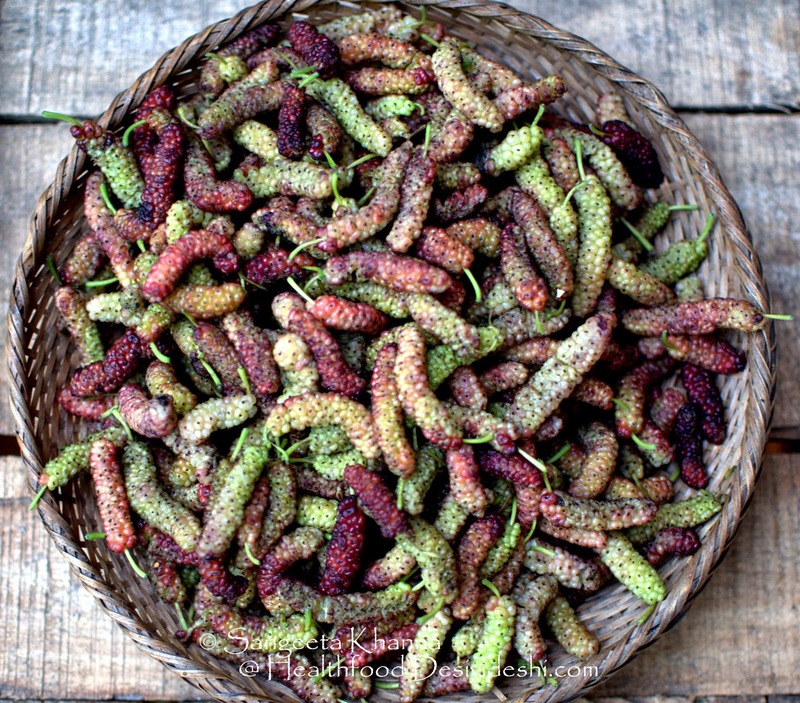 Mulberries grow around my home in abundance and we get to eat them a lot. I make a smoothie with the fresh mulberries, yogurt and a tbsp pf mulberry preserve added to it. Adding a preserve multiplies the flavours of the smoothie a lot. Some fruits we get only in dehydrated form. Kokum is one of them but it makes yummy sweet or savoury drink with a tang.This one is just kokum soaked water with a pinch of soda bicarb and a dash of chaat masala. Serve chilled and see how this drink makes everyone happy. I had it once at a restaurant and have been making it since then. Kokum soda can be made with bottles soda as well. 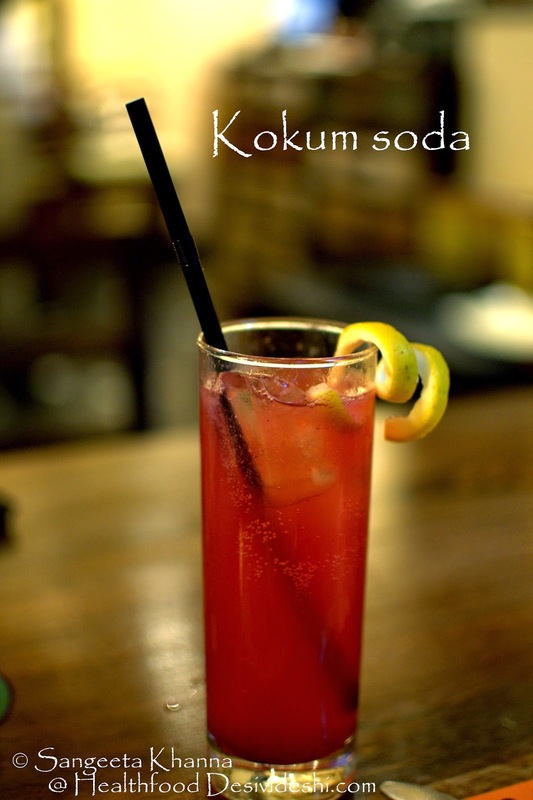 Soak the kokum overnight, use the coloured water to make the drink with added bottled soda. Can we forget the good old buttermilk? This is my go to drink that brings such a calmness with a meal or just after it. This is almost an everyday indulgence for me. 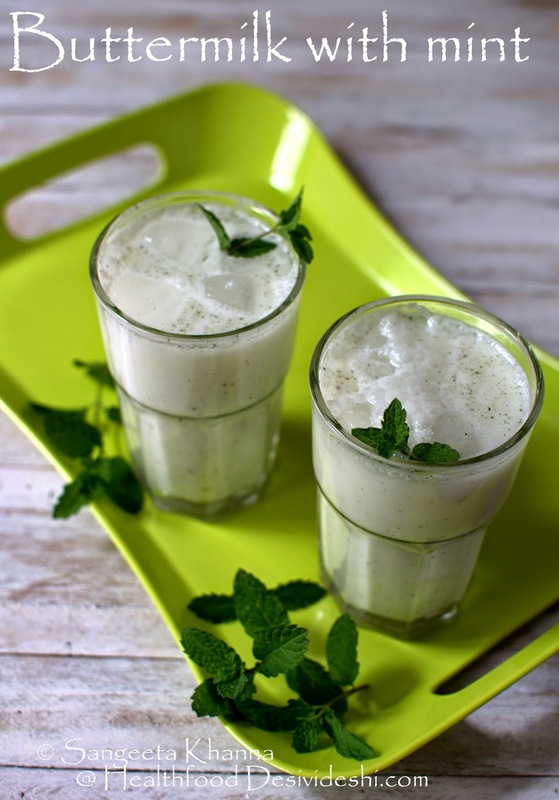 Buttermilk with mint powder. I used home made mint powder. To make mint powder at home you can dry the mint leaves in shade (never in sun or oven as the essential oils will evaporate and mint powder will be a waste) till it gets crumbly. I normally make a loose bunch and hang it in a shady place in the kitchen. The leaves can either be crushed by hand or powdered in food processor. Keep in air tight container. Last but not the least, this curd 'rice' is my savior. I make this cur 'rice' with barley groats, buckwheat groats, amaranth seeds, rolled oats or the different varieties of rice that we use. More about this curd rice later but this barley curd rice is a great cooling recipe for summer months. Check barley congee that has been a favourite as a chilled or cold savoury drink. Tell me what summer coolers you rely upon. There are plenty of seasonal fruits one can use and phalsa is one of those yummy berries that make nice phalse ka sharbat. Jamun is another fruit that we love and make a similar sharbat with it. Bael ka sharbat, Aam panna, Sattu and sattu ka sharbat and list goes on. 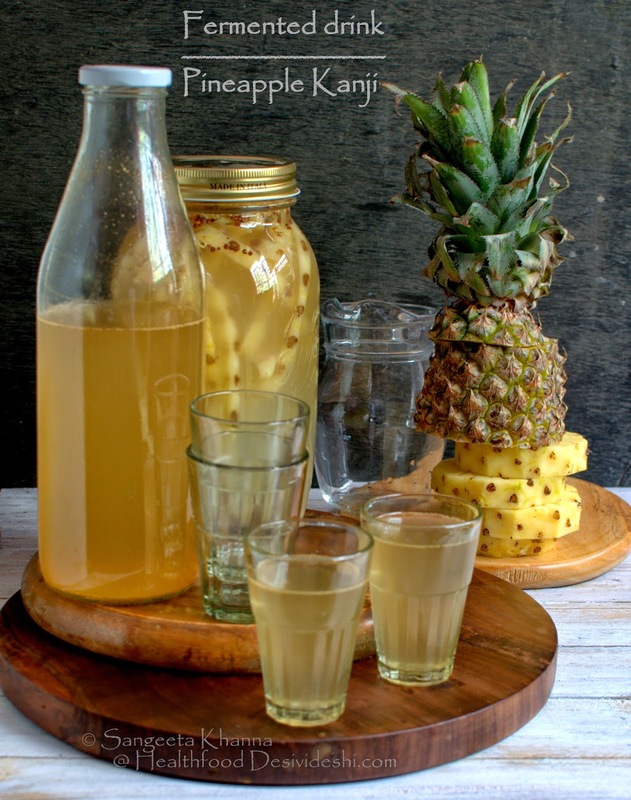 Share you summer coolers recipes as I am sure there are plenty of foods that we all enjoy in different parts of world. I want to know more. so many yumm drinks and salads for summer!!! I have tried some from your posts and will try many more!! I am sure you would like at least a few of these Sush. Love.